Do be prepared to bare your (company) soul. For your PR team to both burnish and protect your company reputation, you must have honest conversations about the good, the bad and the ugly. One of the worst and most counterproductive things that can happen to an agency team is to be blindsided by something a journalist unearths about a client company. The best course is for the client to have a candid conversation about any vulnerabilities, including recent history. If there’s nothing there, so much the better, but a good reporter will find it if there is. Do put important requests/promises and desired outcomes in writing. This, of course, applies to both parties. The best way to prevent misunderstandings is to memorialize any discussions in writing, which is standard operating procedure at most agencies. But it’s even more important to agree on outcomes, and to revisit them regularly. What’s not as useful is to agree to a list of abstract goals like “raising awareness” or “supporting sales” that exist only on paper are aren’t revisited regularly or clearly defined on a quarterly basis. That leaves both the agency and the internal team vulnerable to scrutiny without proper ammunition when budgets are reviewed. Do link PR success to business outcomes. We’ve tackled this topic before but can’t stress enough the importance of setting business-based goals and KPIs at the outset to keep all eyes on the prize. This focus also prevents firms from falling into the trap of “quantity over quality” when setting a media relations strategy. The best compliment a firm can receive is when a client can tie a successful business outcome (increased site visits, conversions or funding, let’s say) directly to PR agency work. 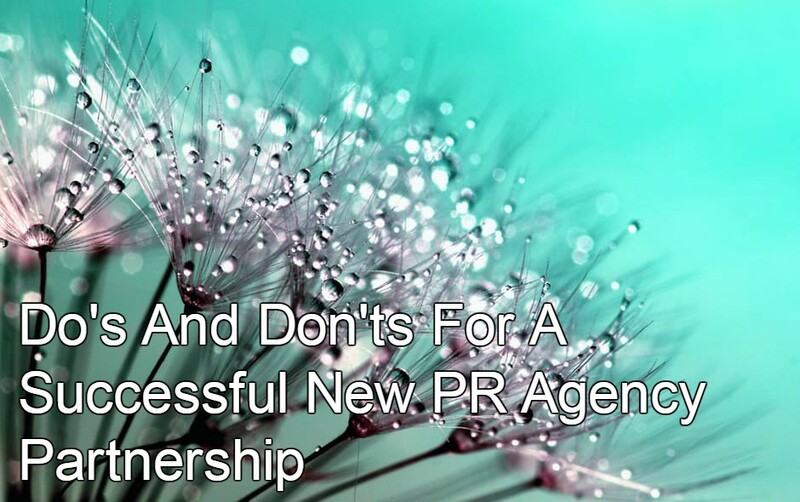 Don’t expect the PR agency to do it all. No PR firm can operate in a vacuum. The best clients feed agencies information early and often. One of our favorite clients begins many conversations with “I don’t know if this will be of any interest” and then lays something very cool on us, such as the first-ever swimming pool design from a 3D printed model. To help jog client memories and keep the pitch pipeline full, we rely on very detailed weekly meeting agendas that provide numerous opportunities for even the most reticent clients to keep us informed of company goings-on. Don’t start the relationship on an adversarial note. A colleague who joined from another agency told us about a client who started a meeting by telling the agency team, “You’re the third firm we’ve had in a year, so, what’s different about you?” We’ve heard entreaties like, “We have very little budget and need to turn things around quickly, so we’re counting on PR!” There’s nothing wrong with stretch goals; in fact, they are recommended. But this type of challenge can set a more negative tone than the client intends and it fails to create the right conditions for success. There’s a fine line between what is challenging in a motivational way and what is simply counterproductive. Don’t be shy about your preferred work style. A good example is to determine how the agency and client communicate ongoing work status. Weekly calls and monthly face-to-face meetings seem to be the agency standard, yet a good client relationship is a flexible one, with each side feeling comfortable to change it up. Therefore, we have some clients who often forego the weekly call – preferring short check-in calls every (or nearly every) day, while others keep mostly to online communication. There are no absolutes, and the best agency partners work to accommodate individual work preferences. Do have each other’s back. As in any relationship, respect and support for each other’s work is critical. Also critical, the ability to forgive a mistake, to pick up the pieces if a deadline is missed and to repair a relationship threatening to go south. For clients, this can mean propping up a PR team member to a skeptic on the client side. For the firm, it may mean doing damage control with a journalist your client snubbed. It’s important to keep in mind that every client/agency relationship has bumps – which we work to smooth out – so we can celebrate the successes that help define a perfect PR partnership.